A code of ethics in IT: just lip service or something with bite? This article is by Robert Merkel, Lecturer in Software Engineering, Monash University and Oliver Burmeister, Associate professor, Charles Sturt University. It originally appeared on The Conversation. The emissions scandal that has rocked the car maker Volkswagen has again raised the issue of ethical standards in the tech industry. Reports so far say the company is pointing finger at the “unlawful behaviour of engineers and technicians involved in engine development”. But that’s led to questions about the strength of any codes or practice or ethics that such operators are supposed to comply with. So are such codes any good or are they just words? Here two software experts present both sides of the argument. The Australian Computer Society’s Code of Professional Conduct says nice, and generally sensible, things about the values its members should act upon in their professional lives. But IT professionals do not get paid by the public interest – their work is mostly paid for by business and sectional interests. While whose interests a business should serve is a subject of lively debate, to a first approximation management of businesses are expected to act in the interests of its shareholders, and within the law. Even if the senior management of a business are technologists, in practice it is the legal and cultural obligations of their management role that are taken more seriously than any professional obligations that apply to IT professionals. In my view, many businesses act in ways that are harmful to broader society in the interests of their shareholders. Some companies have management who, for ethical reasons, choose to avoid certain business activities. But, in a free market economy, if it’s legal (or even if it isn’t) and there’s a dollar in it, at least some businesses will attempt to collect that dollar. These pressures are not unique to the IT industry. Engineers, accountants and lawyers are professionals employed by businesses in a similar way to IT professionals. But there is a key difference between those professions and IT – those professions have professional bodies or closely related registration bodies (such as the Victorian Bar Council) that control access to those skills, backed by the law. The vast majority of Australian IT professionals work in roles for which there is no institutional gatekeeper of any kind, legal or otherwise. Nor do employers demand, or seemingly value, accreditation by professional bodies in IT. Have a look at ads for IT jobs, which overwhelmingly value demonstrated professional experience in technologies and techniques. Credentials, including university degrees, are rarely mentioned. While a body such as the ACS might seek a de-facto gatekeeper role through its credentials attaining employment cachet, it is hard to see how this might be workable. IT work tends to hyper-specialisation, and those specialisations continue to evolve faster than institutions can keep up. And, for what it’s worth, I get little sense in my dealing with both students and current professionals that the IT workforce conceives of itself as a unitary profession, and is looking for an organisation to establish itself as a gatekeeper. So, given the total lack of teeth, and no realistic prospect of gaining any, the ACS Code of Ethics is not something that there is any real obligation to comply with. At best, it is an educative tool and, sadly, not one that students prioritise. Why would they? In a world where IT degrees are viewed as a meal ticket to a high-paying career, students gravitate to the topics which they believe employers will value. Experience in the perceived hot technology of the day is generally a far higher priority than ethics. In my contact with IT students a substantial fraction express concerns about how IT can be put to use. Once in the workforce, some of these students might personally resist it being put to use in particular ways, despite a lack of institutional support and personal costs in doing so. But that’s not enough. As long as those who wish to use IT for sectional interests can pay for sufficient talent, somewhere in the world, history shows that that they will be able to find it, ACS code of ethics or not. In my view, one needs to understand the bigger picture within which the Code of Ethics plays an important role, namely, that there is what we might call “a values shift” in progress. I had the privilege of chairing the process that led to the adoption of the revised Code of Ethics in 2010. It was the first time that the ACS code had been revised in 25 years. One of the things that was very evident from the focus groups and seminars around the country was that a shift in values had occurred. Namely, the environment featured in almost all discussions. It was not even a consideration in previous revisions of the Code of Ethics, but the 2010 version reflects environmental issues, because that was important to many ACS members. Similarly, I believe that there is an increasing values shift towards greater ethical accountability among ACS members. What evidence do I have for this? Firstly, the ACS has twice partnered for projects on professional ICT ethics funded through the Australian Research Council. This shows that at the highest level of research funding in Australia, professional ICT ethics is valued and given more than lip service. The earlier (2006) project had a survey response of 1.9% (351), after holding the survey open for six months. The recent (2013) survey had a response of 12.4% (2,315), and was only open for two months. This suggests that in the intervening seven years, ICT professionals have developed a much greater awareness of, and interest in professionalism and ethics. Secondly, the values shift is seen in that ACS members are voluntarily, at their own expense in many cases, taking ACS Education subjects, including on ethics and professional conduct, and undertaking annual professional development to achieve and maintain a Certified Professional status. 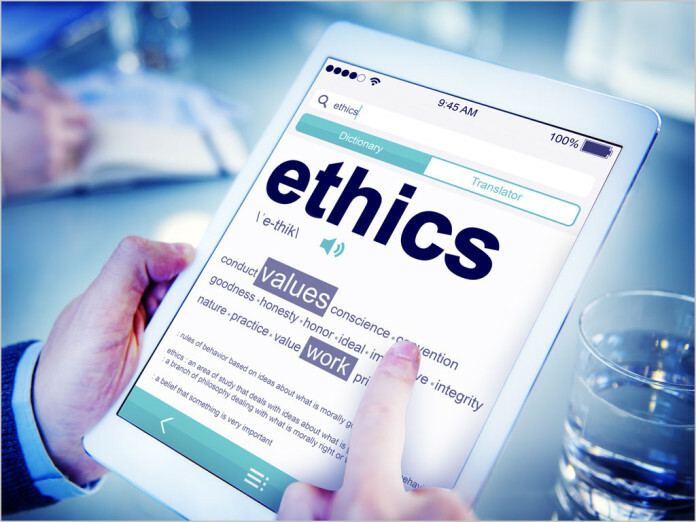 Following a similar successful implementation by Canada’s Association of Information Technology Professionals (CIPS) – the Canadian equivalent of the ACS – the ACS is currently developing an online ethics test, which applies the Code of Ethics to real world case studies, with a view to adding it to the annual certification requirements for professional status. Finally, this values shift is seen in the United Nations agenda, through the WSIS+10 process in Geneva, June 2014, which was tabled at the UN General Assembly in New York. For the first time ICT ethics and professionalism feature prominently. Returning to Merkel’s criticisms of the Code of Ethics, ICT is a young profession. I have attended several meetings at Professions Australia (PA), representing the ACS. It is apparent from those meetings that few professional societies have the clout of the old professions of law and medicine. In law and medicine the “stick” can be wielded – break the ethical code and you get disciplined, which at the extreme could mean being kicked out of the professional society and therefore being unable to practice. But young professions such as ours can’t mandate membership and therefore PA speaks of codes of ethics as “aspirational”. That is, we use the “carrot” and not the “stick” (or “teeth” as Merkel puts it). a disciplined group of individuals who adhere to ethical standards […] It is inherent in the definition of a profession that a code of ethics governs the activities of each profession. Such codes require behaviour and practice beyond the personal moral obligations of an individual. They define and demand high standards of behaviour in respect to the services provided to the public and in dealing with professional colleagues. Further, these codes are enforced by the profession and are acknowledged and accepted by the community. Therefore one measure of professionalism is a willingness to be held accountable for the standard of one’s work, against the Code of Ethics. So Merkel appears correct that in the past the Code of Ethics had limited traction. But my view is that there is a shift in values in progress and with that shift the Code of Ethics is gaining in importance. Robert Merkel, Lecturer in Software Engineering, Monash University and Oliver Burmeister, Associate professor This article was originally published on The Conversation. Read the original article.